I’m sure you’ve heard the basics of this film. 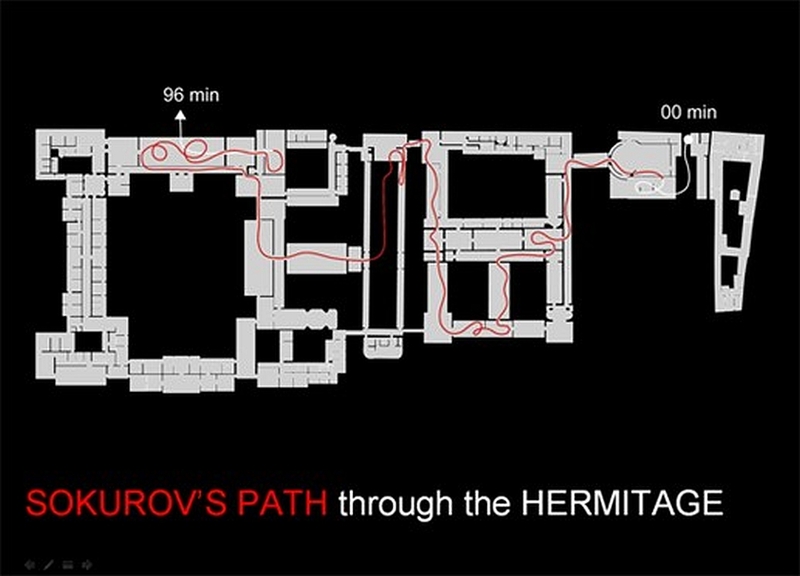 One long, single take of a walk through the Hermitage in St. Petersburg, and Russian history. The techical achievement is amazing, but for me the historical element was very minor. Sure, there were scattered references to historical figures and events, but they were in no real order. Nor was the movie a guided tour of the Hermitage. If there is a plot or a message, it’s that museums serve as repositories of civilization. The whole thing was intended to come across as a dream – and it does that extremely well. It’s shot from a first-person perspective, like some “first-person shooter” game. The narrator, who is never seen, “wakes up” in a daze. There’s only one person who acknowledges his existence, a mysterious “nobleman in black” who acts as a sort of spirit guide through the museum. The single shot is vital to the dreamlike atmosphere. You drift through halls, galleries, and passageways, turning this way and that, never certain where you are. You may enter a room with no other entrances apparent, then turn a little and suddenly find yourself in a hallway. After a while, I gave up trying to create a mental map of the place – I could no longer tell where I was in relation to where I had been. I have to wonder why I’ve been able to find only one small map (I doubled the image size in the attachment below) online showing the camera’s / viewer’s route through the museum. I thought of doing it immediately after I finished watching the movie! One other thing regarding the technical achievement of the movie. It’s not just coming up with the idea of a “single take” movie that’s amazing; there’s all the support crew required. As I was watching the credits scroll by, I couldn’t help but notice that there were dozens upon dozens of gaffers listed. Gaffers are the electrical and lighting technicians, and they had a hell of a job to do here. Not only do you have to have all your lighting equipment set up in each and every room, you have to place it where it gives the required lighting without being seen as the camera moves and turns! Nor can you let a single foot of cable be seen! In a studio production, it’s no big deal. You can hang lights from the ceiling, and run the cables behind flats and furniture. But in a museum, you do not get to knock holes in the walls and ceiling to run cables and hang lights! No wonder they needed so many gaffers…. Anyway, when you do see this movie, forget art and Russian history. Don’t worry about that; this is not a tour. Instead, lose yourself in the dream. Like a dream, you probably won’t remember details afterwards. But you will remember the indescribable feelings.